Vanderbilt-Ingram Cancer Center (VICC) is leading a Phase 3 global trial of a cancer therapy that was initially tested and validated in a VICC research laboratory. One of the first patients treated with the therapy came to VICC after a bump on the head led to an unexpected cancer diagnosis. That head injury may have prolonged Shawn Morgan’s life. The school bus driver and swimming instructor from Sparta, Tennessee, spent several days in pain following a collision with a cabinet before family members persuaded her to visit a nearby hospital emergency room. Tests revealed a devastating illness. “I had all these bleeds in the brain and I was very close to death. They told my mom I had cancer, and it did not originate in the brain, it’s in the lung,” Morgan said. Looking back, the mother of nine children realized that a persistent cough that lasted for months was a symptom of the lung cancer that had advanced to Stage 4. She received radiation therapy for the brain metastases, but doctors told her family there was no hope of survival. 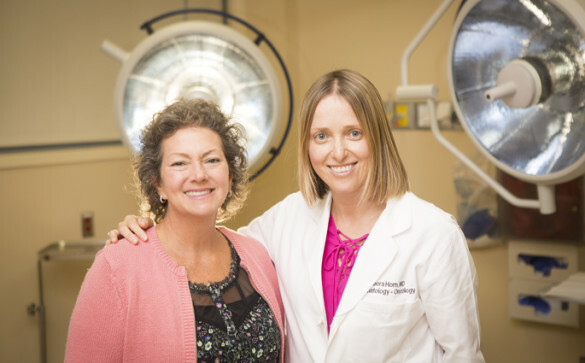 Morgan’s mother had other ideas and requested a second opinion at VICC, where Morgan was referred to Leora Horn, M.D., M.Sc., associate professor of Medicine and clinical director of the Vanderbilt Thoracic Group. Horn collaborates closely with Christine Lovly, M.D., Ph.D., who operates a research laboratory at VICC. The timing of Morgan’s diagnosis coincided with lung cancer research that had already been done in Lovly’s lab. “Several years ago a company called Xcovery approached Vanderbilt about doing some preclinical drug screen studies to try to identify novel, more potent and more selective inhibitors of a target called ALK,” said Lovly, assistant professor of Medicine and Cancer Biology. Mutations in the gene encoding anaplastic lymphoma kinase (ALK) are found in several types of cancer, including non-small cell lung cancer, lymphoma, sarcoma, and a childhood cancer called neuroblastoma. ALK tyrosine kinase inhibitors are effective therapies for patients whose tumors harbor ALK mutations. “Our collaborators at Xcovery designed several potential ALK drugs, and then all of the pre-clinical studies to find the lead compound were done here in our laboratory,” Lovly said. As a result of Lovly’s preclinical drug testing, a new ALK inhibitor drug called ensartinib (or X-396) was identified. VICC led the Phase 1 and 2 clinical trials of the new drug. When Morgan arrived at VICC, Horn requested molecular testing of her tumor, which is standard of care for all non-small cell lung cancer patients. She was hoping that her patient’s young age (Morgan was 51 at the time) might point to an ALK mutation. “Many of our ALK-positive patients are younger than the average lung cancer patient and were never smokers,” Horn said. VICC routinely offers tumor mutation testing for all lung cancer patients, and Morgan’s tumor was ALK positive. She qualified for a clinical trial and was one of the first patients treated with the new drug, ensartinib. For several years she has been taking the oral medication, eating a healthy diet and getting plenty of rest. Before starting the trial, Morgan said she was so weak her children had to nearly carry her up a flight of stairs. Today she quickly bends down to touch her toes to demonstrate her flexibility. Not all patients have the same response to therapy and it isn’t clear if the Phase 3 drug trial will be successful. But Horn said these clinical trials highlight VICC’s strengths as a research center. “This is an example of our translational research and our leadership in precision medicine, including collaboration with industry,” Horn explained. Lovly said VICC’s commitment to laboratory excellence is accelerating the pace of cancer drug development. “This was rapid development of the drug, starting with a couple of hundred compounds in the lab here at Vanderbilt leading to a global Phase 3 trial in six years. We are excited to be part of the development of this drug,” Lovly said.